This is my guest room. It is red. It was red when we moved in the house. I love red. 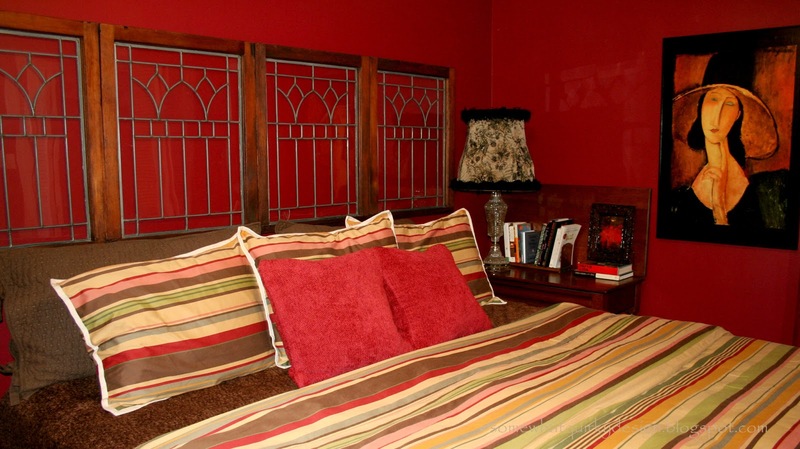 I've always had red in my house, but not in a bedroom. I like it. I'm not sure that it isn't cruel to make guests sleep in a red room, so I try to feed them well and offer lots wine. 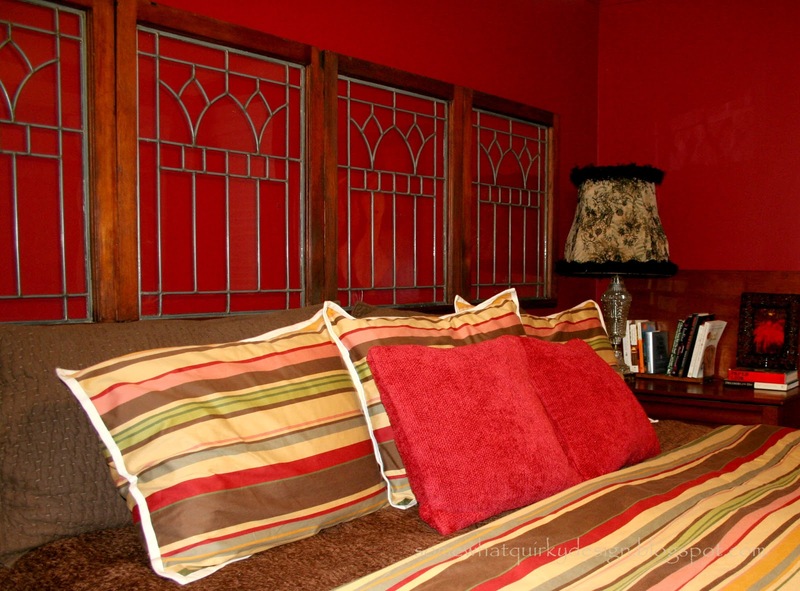 Even though this is the room where Peggy Sue lives, my favorite thing in the room is the headboard made from windows. 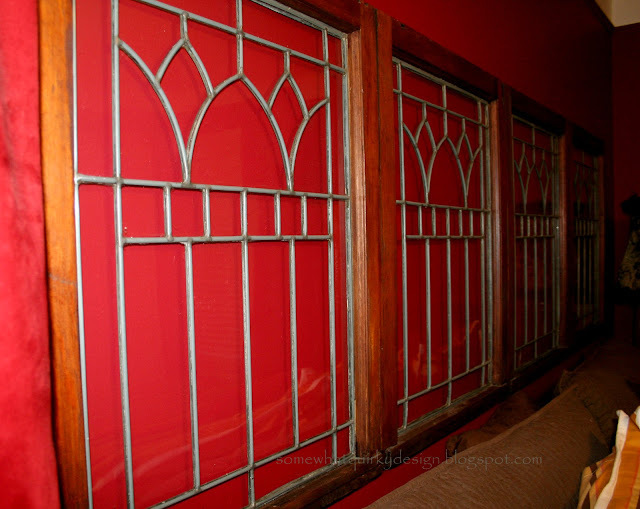 I saw these windows at a garage sale while I was out walking one Saturday. I'm rather a sucker for windows. Usually the ones I like are gross, have lots of barn dust and spiderwebs covering them, and have a broken pane or two. These were perfect - and were only $25 for all four of them. Oh my. I prefer my windows to be of the free kind. But the chances of finding 4 matching leaded windows with not one broken pane and all the leading intact is REALLY remote. I usually carry a buck or two with me when I walk so I gave the host a $2 deposit and RAN the 3/4 mile home to pick up my car and get some more money. There was nothing charming about the paint on either side. So I picked out my favorite side - the one I wanted to show - stripped the paint, and stained them with Old Masters Dark Walnut Gel Stain. This took a while, but wasn't too bad. The worst part was that I cracked one of the small panes in one of the windows. SAD. I try not to focus on that. It is VERY difficult to get good pictures in a red room. Any tips? Today I'm partying over at Miss Mustard Seed's Furniture Feature Friday. Check it out! Come visit me sometime. We'll make something wonderful together! smaller aperture with longer exposure times would probably help with picture quality, especially with photoshop :) just use something as a tripod of sorts so you don't get blur. 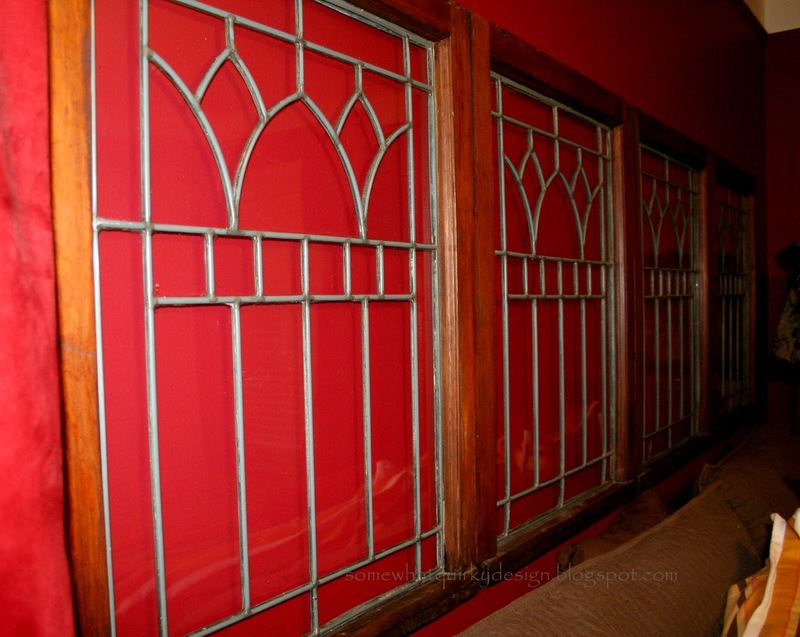 oh, and i'm sure you told me about these windows, but now that i can actually SEE them....I LOVE 'EM! I also have a severe weakness for windows. 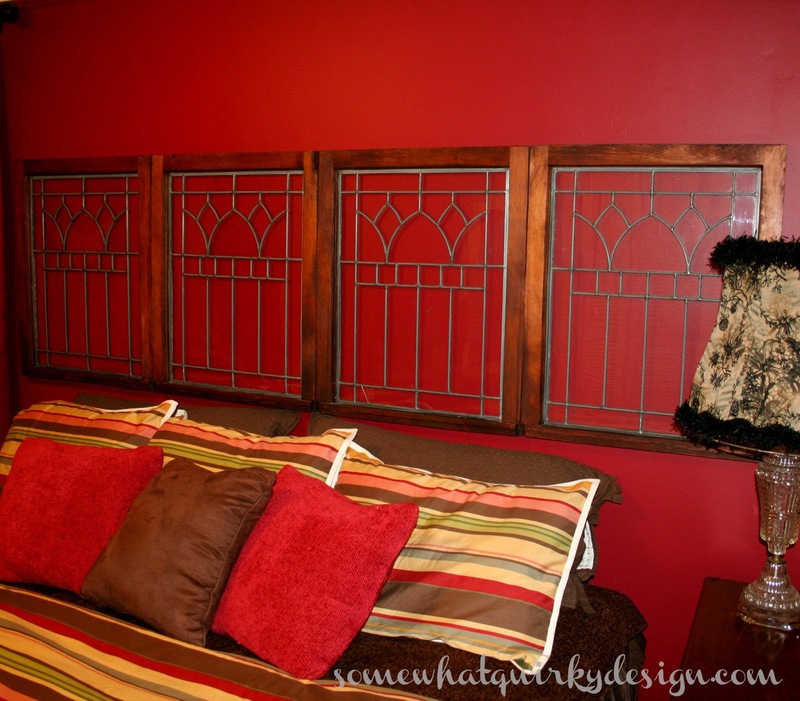 These are gorgeous, and I am blown away by how you used repurposed them as a headboard. SO CRAFTY!!!!! Loving your blog, by the way. Thanks Tiff. Glad you are enjoying the blog - and following me! Very unique. Great price on the windows. I love the whole room. Thanks Rosemary! Good to hear from you. Don't you just love a good buy?